Hi everyone, and welcome to the November issue of the Shanville Monthly! I thought, heading towards the end of October, that I might run late with this one -- I went to New York on a short holiday, and almost got stuck there when Hurricane Sandy struck!! Luckily I managed to get out in the nick of time, on one of the last flights out of JFK before its transAtlantic flights shut down, so it's business as normal -- phew!!!! In more regular Shan news, Zom-B went on sale last month in the UK, Ireland, America, Canada, Australia and New Zealand, and has been attracting rave reviews and sparking lots of heated debate, as you'll see as you read on. With a new book in the series out every 3 months, we're never going to be far away from a Zom-B exclusive over the next couple of years, and this month I'm delighted to announce the title of Book 3, along with the British and American covers for it. I'm also going to reveal some of the interior art from Zom-B Underground. There's news of Zom-B's first Award nomination. Early details of tours in Scotland and the USA. And lots more. So let's crack on with things, shall we?!? If those vicious beauties don't send a shiver down your spine, I don't know what will!!! Zom-B City will go on sale in the UK and USA in mid-March 2013. Before that, at the start of January 2013, the second book, Zom-B Underground, will go on sale. I've featured the covers in an earlier issue of the Shanville Monthly, but if you want to refresh you memory, you can find them by CLICKING HERE. You will also be able to see rough drafts of all three covers, along with the covers of every other book that I have ever released, from all around the world. Moving forward, don't forget to bookmark and keep checking out the Zom-B UK site. Run by my publishers, Simon & Schuster, it will feature exclusive downloads, competitions and more over the course of the series -- at the moment there's a fab comp where you can win the first two Zom-B books, along with a limited-edition T-shirt!! I'm delighted to be able to announce that Zom-B has been shortlisted for the Bord Gais Irish Children's Book Of The Year Award, Senior Section. This is the third time that one of my books has been nominated, so hopefully it will be third time lucky and I'll snag the main prize this year! But it's a very strong shortlist, so I won't be too disappointed if I get pipped to the post by one of the other contenders. Irish fans can be part of the voting process, so if you want to give Zom-B YOUR vote (and I sincerely hope that you do -- and try getting your friends, classmates and Granny to vote for it too!!! ), CLICK ON THIS LINK and follow the voting link from there. Although there are several sections, you do not have to vote in all of them -- you can vote in as few as you want. Zom-B is now on sale in bookshops all across the UK, Ireland, America, Canada, Australia and New Zealand. It's also available online through Amazon, Barnes & Noble and lots of other internet sellers. And you can download it too onto your Kindle, Nook Book or alternate eReader. The book has been attracting rave reviews. It's quickly become my most-reviewed book in many years, and almost all of the reviews have been extremely positive. Of course you can't please everyone, and there have been a few grumbling comments too, mostly by critics who felt uncomfortable about the racism element. But I have a policy of using my site to include every review that I come across, the good, the bad and the ugly, so you can go check them all out by CLICKING HERE, where you will find that the overwhelming consensus is that the book is a HIT!! To be honest, I was nervous about how Zom-B would be received, because of the racism, the gore, the shortness of the book, the fact that it's the first of a series and ends on a cliffhanger. So I was very relieved when it started picking up the sort of reviews that writers can normally only dream about! I was also pleased to note that hardly anyone guessed either of the big twists that come near the end of the book, and most of the reviewers have worked hard not to give the game away (although some DO include spoilers, so tread carefully when reading them!). The main twist (where B's full name is revealed) set heads spinning everywhere -- some fans actually thought it was a misprint when they read it!! 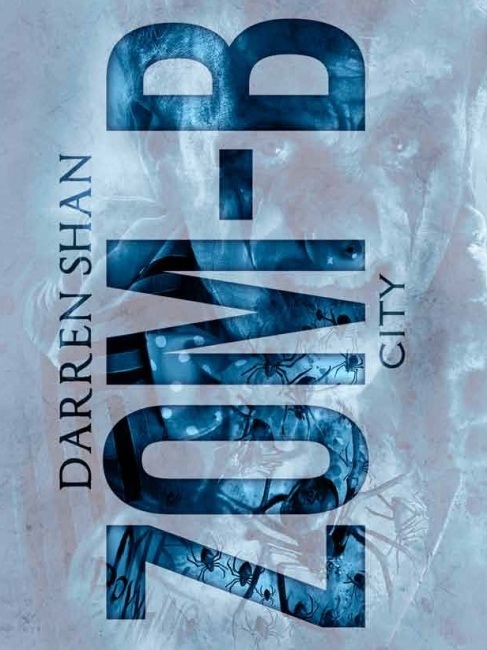 I have written about this on the Darren Shan Messageboard, so if you want to see what I have to say about it, and to join in the discussions of the book with other fans, CLICK HERE. I'm not going to say what exactly is going on in this scene, except it's not as straightforward as it might perhaps look! I'll be talking more about the book in the next couple of issues of the Shanville Monthly, and revealing two more ultra-cool images as well, so make sure you come back and check at the start of every month! MIn addition to that sneak peek into the future, here's a sneak peek backwards, to when I was on tour with Zom-B in early October. This is a video clip of me taken at the Bath Festival, reading out the prologue to the book. It's edited down slightly from the book -- I always edit down scenes when I read them out at events, to make them flow more smoothly. If you weren't able to make it to any of my events last month, this gives you a taste of what you were missing!! To view it, CLICK HERE. I've added my author notes for both Zom-B and Lady of the Shades to my site. I do this for every book that I write, providing you guys with some behind-the-scenes details, talking about what inspired the books, why and how I wrote them, the difficulties I faced, some of the decisions that went into choosing what made the cut and what got cut out. You can read my Lady Of The Shades notes by CLICKING HERE. And you can read my notes for Zom-B by CLICKING HERE -- but please note that I will be adding some extra notes about Zom-B when I come to write my Zom-B Underground notes, partly because I didn't want to write too extensively in the first section, but also because I didnt want to spoil a major twist for those who wanted to read my notes before they read the book. Although Lady Of The Shades was released in the UK as an eBook at the same time as the hardback release, the first three books that I wrote for older readers, The City Trilogy, were only recently made available in eFormat. You can now download them from Amazon UK for your Kindle or other eReader. The City Trilogy books are also available in eFormat in the USA -- you can find them on Amazon.com along with the hardback and paperback editions. To download Book 1, Procession of the Dead, CLICK HERE. To download Book 2, Hell's Horizon, CLICK HERE. To download Book 3, City of the Snakes, CLICK HERE. A SHORT STORY, A TRUE RECOLLECTION, AND INTERVIEWS GALORE! I wrote a special Halloween-themed short story for The Times UK, called "A Change Of Heart," which appeared in the print edition of the paper on October 30th. You can also access it online by CLICKING HERE, but unfortunately you need to subscribe to The Time in order to do so. I will make it available for free on my site at some point in the future. I also wrote a short recollection of one of my scariest memories, about something that really happened to me on a roller coaster many years ago. You can check it out by CLICKING HERE. In addition, I've given a LOT of interviews over the last month, mostly talking about Zom-B.Here are all the ones that have been published online. If you read them all, you'll probably end up knowing even more about me than I do!!!! This is a lengthy one that appeared in Editor's Article. Here's another lengthy, probing interview, from Book Page. There was an in-depth interview with me in The Telegraph in the UK. Another long one in ACHUKA, whuch also included a link to one of my earliest ever interviews! A shorter interview on Bookbabblers. There was an interesting feature on me in Get Bracknell. I was chuffed to also be interviewed by the internationally renowned Huffington Post. Here's a piece about one of my events while on tour, from The Blackpool Gazette. Another in-depth interview from the excellent Books For Keeps. For a more general interview about writing, see this one in Red House Books. And finally, scroll to page 22 to find my interview in Motley Magazine. I love this story of a true-life young hero in the USA who saved his mother's life, following a spot of top-notch reading!!! Gavin Dillard -- I salute you!! To find out why, CLICK HERE. I will be doing a short tour in Scotland to support the release of Zom-B Underground in January, with maybe one or two London signings thrown in for good measure. I will be revealing the details in the December issue of the Shanville Monthly, so check back then. But what I CAN reveal right now is that the tour will include an online, interactive event, open to schools all around Scotland. The project is called Authors Live, and is run by the ever-brilliant team of The Scottish Book Trust. It will be during school time, so you will need to get your teacher to register for it. Once they do, you and all of your classmates will be able to watch the event live on Thursday, January 24th at 11.00am. You will even be able to submit questions, although as questions will be coming from schools all over the country, I will only be able to answer a small sections of them. To learn more about the event and to register for it, CLICK HERE. In other VERY exciting news, I am absolutely thrilled to be able to announce my first American tour in over 2 years!!! I did a one-off event in New York in October, but this will be a full-on, two-week tour that will take in several areas. I don't get to the States on tour as often as I would like (it's a long way from Pallaskenry in Limerick!!). The last time was November 2010. My publicist is in the middle of putting the tour together. I know that I'm going to be starting in Seattle, but nothing has been pencilled in for definite after that. Which means that now is the perfect time to pitch for me, if you want me to do an event or signing in a school, library or book shop near YOU!! Pitching for me is simplicity itself. I'm going to be listing the contact email for my lovely publicist, Hallie, below, who has bravely volunteered to consider all requests. There are just a few rules you need to follow to ensure that your entry is given serious consideration. First, pitches need to come from either a teacher, librarian or bookseller. So if you're not one of those (i.e. if you're a student, or simply a fan of mine) then you need to approach your teacher, librarian or local bookseller and try to get them interested. If you succeed, they can then submit a request to Hallie. Second, please supply as much information as you can, e.g. the size of your school/library/book store, the number of students/fans you can squeeze into the event, or the numbers you hope to attract if you're a book store, where the event would be held, how far away you are from an airport, etc. The more advance info you can supply, the better your chances of catching Hallie's eye! Third, if possible, try to unionise. If you have contacts in neighbouring schools/libraries/book stores, try to get them interested as well, so that you can submit a joint request. The USA is a massive country. Hallie is unlikely to fly me in to a State fo a single event, but if you can offer her 2 or 3 or 4 events in neighbouring districts, she might be tempted. Finally, DO NOT TRY TO CON HALLIE OR ANYBODY ELSE!!! On a previous tour, one over-excited fan tried to lure me to their home state by contacting their local store and pretending to be my publicist! Their cunning plan was seen through almost immediately, and as a result their state was blacklisted for that tour!! Play by the rules, people, OR ELSE!!!!!! So, having said all that, I wish you all the best of luck in trying to "snag me". My favourite events are the ones that are instigated by fans, so I hope lots of you seize this opportunity and give it your best shot. 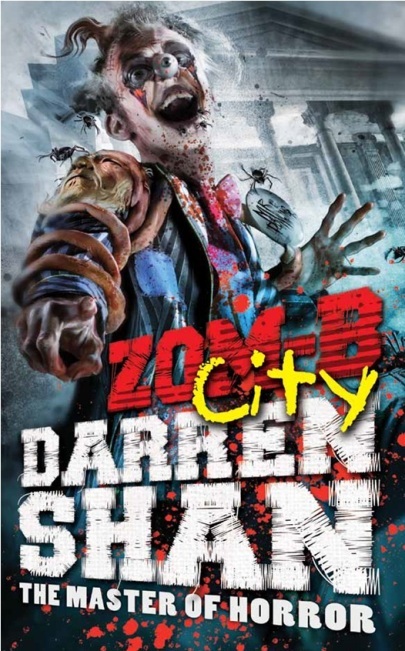 Arranging a Darren Shan event is difficult, but by no means impossible. And who knows, if there are masses and masses of requests, maybe my publisher will bring me back again sooner rather than later, to hit the areas that we arent able to hit this time!